We know what you're thinking reading the headline. Here's another company we've never heard of, announcing a spec-busting smartphone out of the blue and having nothing to show besides lavish concept images. Thankfully, the Highscreen ICE 2 is a product of a legitimate company. Highscreen is a brand which German firm Vobis has been developing on Russian soil since 2009, selling tablets, notebooks, and accessories under the moniker. Now, what about the phone itself? Unlike the YotaPhone 2, the ICE 2's "second screen" is just a tiny stripe that displays incoming calls, text messages, the time, weather updates, and notifications. Although it's a novel solution, we're not sure how practical it is, but you can still check the time and spot notifications without powering up the display, which will help battery life. On the ICE 2's front panel, you'll find a circular home button that contains a notification light, which can be configured to visualise alerts from any application with one of seven colors. Above it, there's a 4.7-inch 720p screen. The rest of the setup is completed by a 1.7GHz MediaTek MT6592 processor, 2GB of RAM, 16GB of expandable storage, a 13MP main camera with a Sony sensor, and a 2MP front cam. The device is powered by a 2550mAh battery and runs Android 4.4 KitKat. 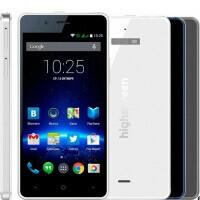 The Highscreen Ice 2 will cost around $275 (14,990 RUB) in Russia, and will be sold in white, blue, and gray. I'm waiting for someone to call this a copy of the iPhone. you already did. so there's no need now.